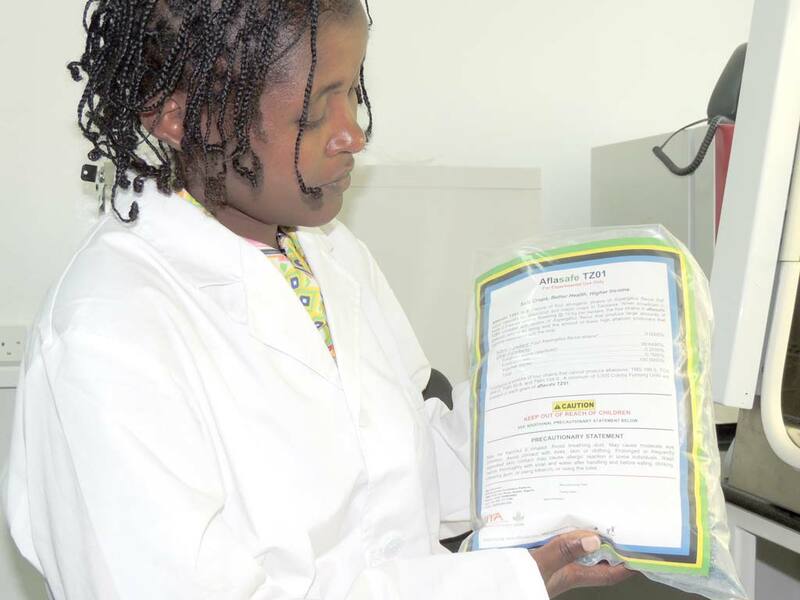 Dar es Salaam – Results from two-year field trials of AflasafeTZ, an innovative technology to control aflatoxin contamination, have proven the effectiveness of the technology in reducing the poison in maize and groundnut. The trials were conducted in many sites across the country, which are known hotspots for aflatoxin contamination—Babati, Chamwino, Chemba, Kibaigwa, Kilombero, Kilosa, Kiteto Kondoa, Kongwa,Masasi, Mpwapwa, and Nanyumbu. Overall, the technology was able to reduce contamination of aflatoxin on maize and groundnut by over 85% to levels that are fit for human consumption. The field studies were conducted by a team from the International Institute of Tropical Agriculture (IITA) in partnership with the Department of Biocontrol at the Ministry of Agriculture, with support from many international partners including USAID. The findings were presented at a meeting of stakeholders at IITA offices in Dar es Salaam. Aflatoxin is a poisonous chemical produced by naturally occurring fungi Aspergillus flavus that is found in soils and is a serious threat to health and food security in the country and many parts of the world. Aflatoxin has been associated with cancer and other liver diseases, reduced immunity, and stunting in children. In cases of acute poisoning, as witnessed in Tanzania and Kenya, poisoning can lead to death. Aflasafe, on the other hand, is a technology first developed by the United States Department of Agriculture (USDA), and IITA and its partners are spearheading its adoption in Africa. It is a biocontrol product developed using the same family of fungi as those that produce aflatoxins, which do not produce the poison and are further able to outcompete and displace the aflatoxin producing fungi. The AflasafeTZ is made from country-specific strains of the fungi. “We are happy with the findings, which are consistent with the results from other countries where the product has been tested. The next step is to present the dossier on its efficacy and safety to the biocontrol registration committee, so the technology can be officially released in the country,” said Dr George Mahuku, IITA plant pathologiest who is leading these efforts in the country while presenting the results. “Aflatoxin contamination is a major challenge in the country. Therefore, we are happy that we have this technology that has shown it can work. Once it is registered, we will then face the next hurdle of getting the technology to as many farmers as possible to ensure our food is safe and free from this killer,” said Beatrice Pallagyo, Assistant Deputy Department of Food Security, Ministry of Agriculture who has also been working on developing the technology. “The technology is easy to use. The farmers simply scatter the aflasafe in their fields 50 days after planting their groundnut or 3 weeks to flowering for maize. The technology will also need partnership with the private sector for mass production of the technology to ensure it reaches farmers, it is affordable. IITA will provide technical back stopping,” she added. The technology is currently in use in Nigeria, Kenya, and The Gambia. Nine other African countries are at various levels of developing their country specific strains. These include Senegal, Uganda, Zambia, Malawi, Mozambique, Rwanda, and Burundi. The participants at the event were impressed with the technology and urged urgent action to ensure it is available in the country to ensure safety of food and feed. “As regulators, we are interested in ensuring the safety of the product to humans and to the environment. From the presentation, all the relevant toxicological and environmental data which determine to what extent the effects on health and environmental safety have been generated using good laboratory practices and in accordance to international guidelines. It is therefore safe if it is used accordingly,” said Habib Malanda, Principal Scientists Tanzania Pest Registration Institute (TPRI). ‘This was an important session. I have been able to get the real picture of aflatoxins and am happy that there is a solution. As the private sector, we are looking forward to having the product registered in the country and available in the market. It will definitely change the lives of farmers,” said Harish Dhutia, Chairman, Crop Life Tanzania. One of the researchers from the National Agricultural Research Institute who was also at the meeting was happy with the progress, “We started this journey in 2012 and I am happy we have come this far. A lot of research and science has gone into developing this product. It has potential to make food safe for the people of Tanzania. It also presents business opportunities for the private sector to commercialize it and make it available. We therefore look forward to its commercialization to make food and feed safe for the people of Tanzania,” said Dr Ari Mponda, Principal Agricultural Officer/Acting Director from the Agriculture Research Institute (ARI). The next step is for the team to present a dossier to the government approval board. The International Institute of Tropical Agriculture (IITA) is a not-for-profit institution that generates agricultural innovations to meet Africa’s most pressing challenges of hunger, malnutrition, poverty, and natural resource degradation. Working with various partners across sub-Saharan Africa, we improve livelihoods, enhance food and nutrition security, increase employment, and preserve natural resource integrity. IITA is a member of CGIAR, a global agriculture research partnership for a food secure future.